It is a software which can extract speeches from free-speech video and is able to convert the WAVE MP3, WMA, AAC, OGG, M4A and a variety of audio files into no protection files, then you can trim them for personal use. As audio and video extraction software, it is also possible to extract audio from popular video files like MP4, AVI, WMV, MKV, and MPEG. 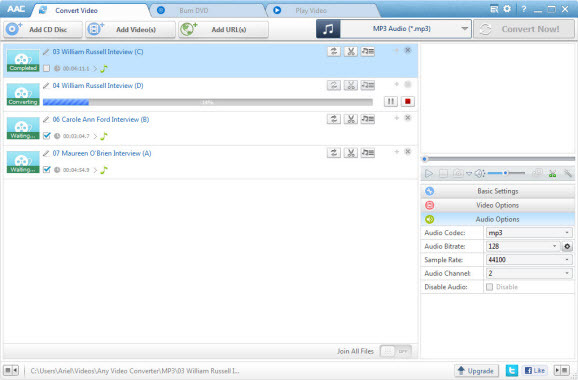 After you run the program, Click the "Add Files" button to select audios and videos from your hard drive. Click Output Format drop down menu to select the output profile. WAV, WMA, OGG, AAC, MP3, M4A, MP2, FLAC, AIFF, DTS, AU audio output formats are available. Note: Before converting, you can customize the output settings such as audio codec, sample rate, audio channel, audio volume, aac parameters, mp3 parameters, misc, etc. Add Lyrics, edit ID3 Tag and trim audio into small clips are also available. Click Convert button to start to convert video/audio conversion. If you want to stop the process, please click Cancel button. After the conversion, you can click the Output Folder button at the bottom of the program to get the converted file and transfer to your Apple Products, Sony Products, Microsoft Products, mp3 player or hard driver. Step 1: Click Download tab in the main window to open the "Video Download" window. Step 3: Select the download format from the pop up window. Click Download to confirm. Note: If there are multiple videos you would like to download, click Add Video to Download button in the upper right corner and paste URLs to the pop up window. Click Download to start downloading. You can pause download process by right-clicking the downloading video and choose Pause/Pause All. After that, you can right-click on video downloaded on the right panel and select Open file Location to find downloaded videos in your computer. Step 5: Click Convert tab in the main window to open the "Audio Conversion" window. Click Convert button to start to convert video/audio conversion. If you want to stop the process, please click Cancel button. After the conversion, you can click the Output Folder button at the bottom of the program to get the converted file. It’s a amazing program. I have used for one year. And every time it works perfectly to convert my audios. The custom service is also very patient for my any question. Any Audio Converter is worth using.